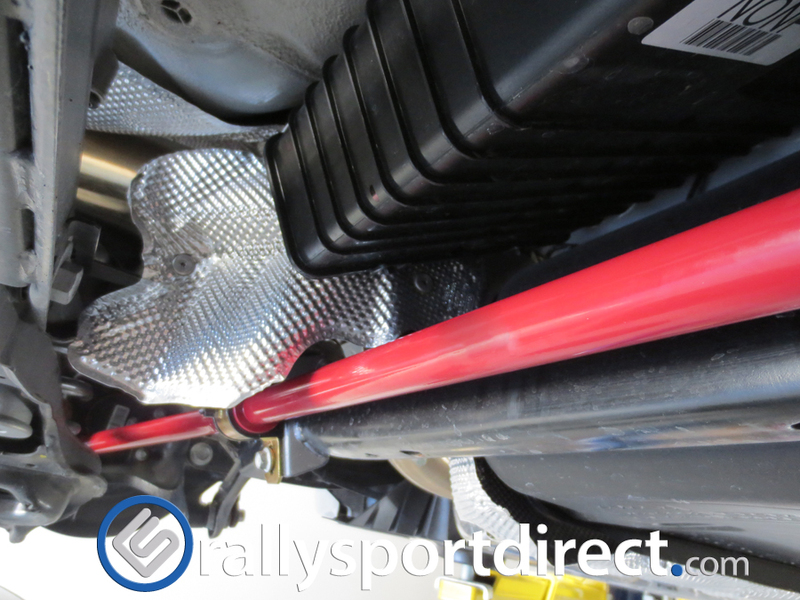 Today we went ahead and installed the Eibach sway bars on our White Sheep Focus ST! 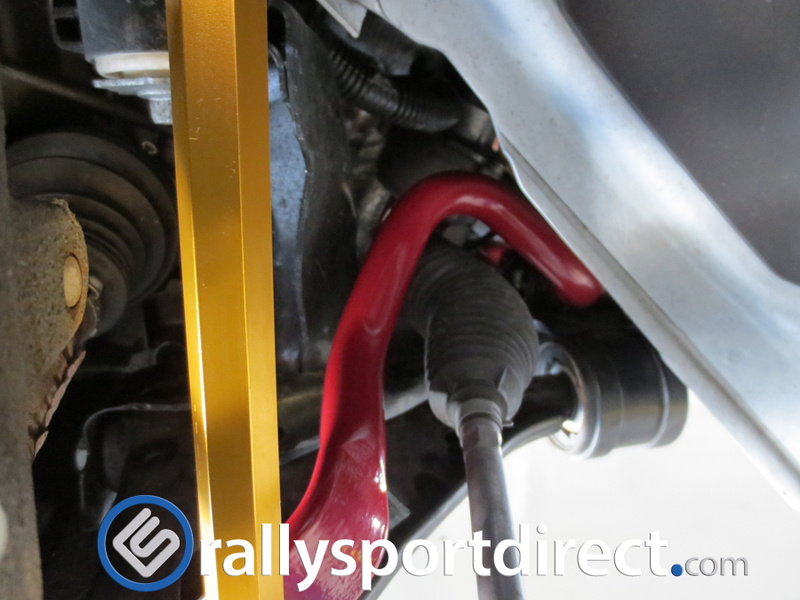 The factory sway bars are pretty robust from the factory, but there is always room for improvement. 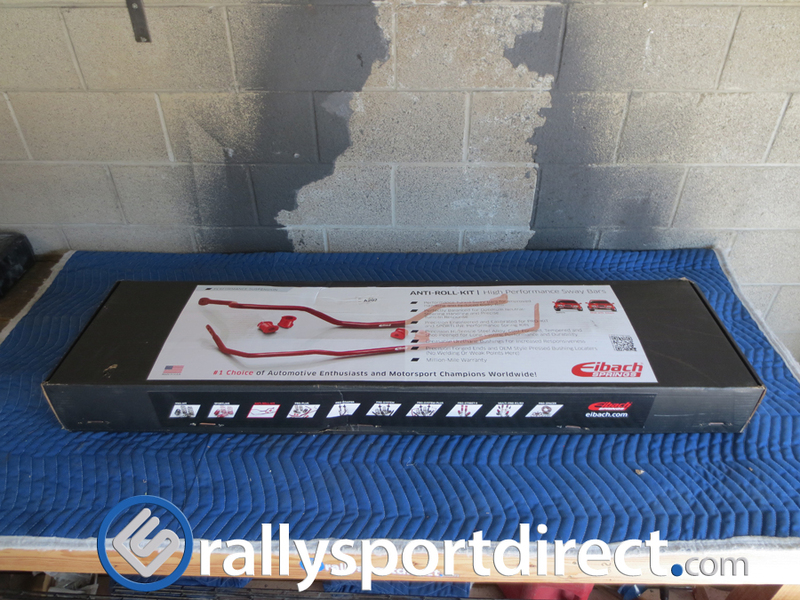 Enhance your suspension upgrade with an Eibach Sway Bar Kit. 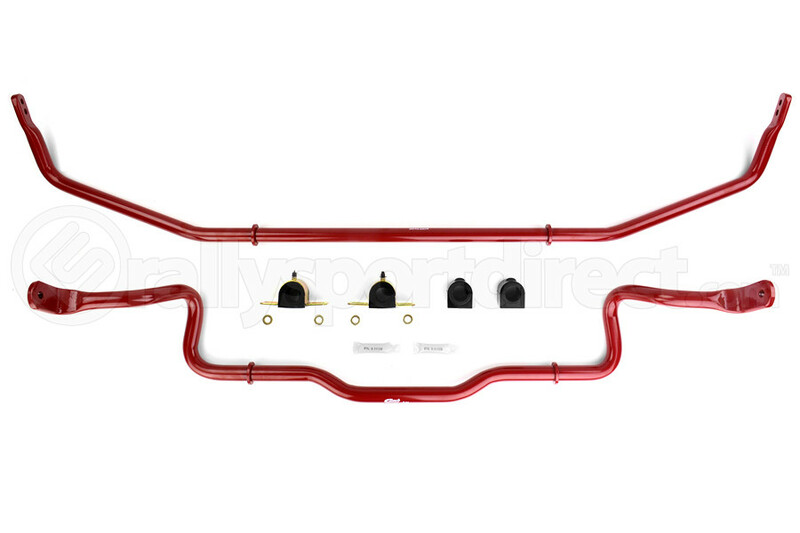 The Eibach Sway Bar Kit allows critical fine-tuning of your car’s handling characteristics. 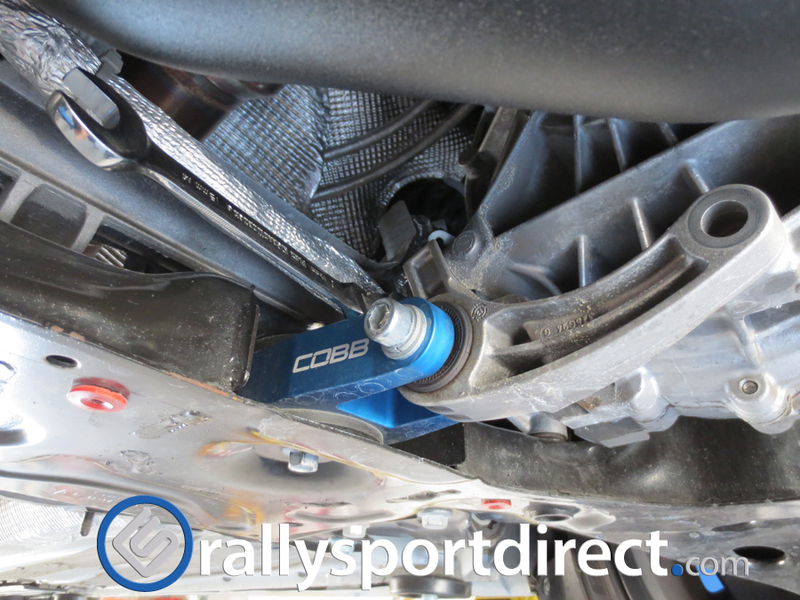 With these being adjustable we can take full advantage of the cars suspension upgrades, we wanted to be able to tune it down for daily driving and stiffen it up for when we head out for a day at the track. Without further delay, let’s get on with the install, shall we? 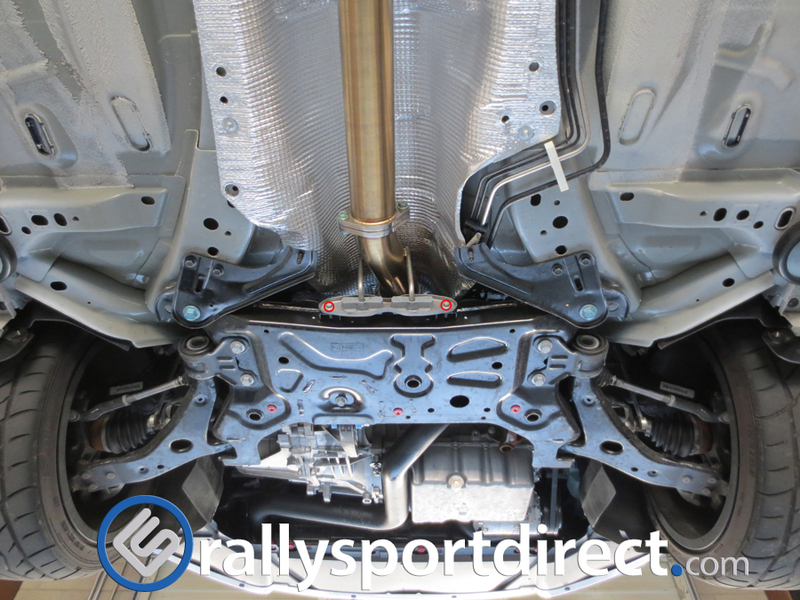 One thing I think we should mention here is we have to drop the sub frame to get the front sway bar out of the car. 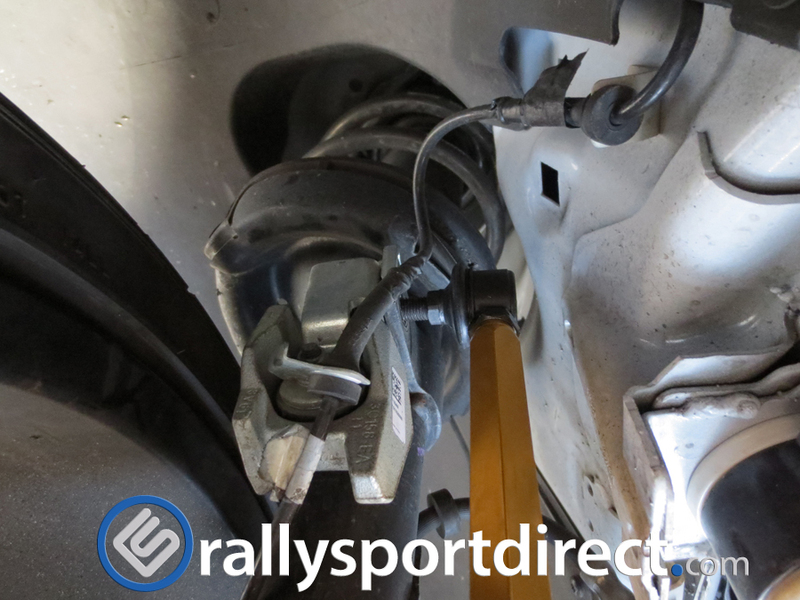 If you don’t feel confident in your ability to do this, we recommend having a mechanic perform the installation of the front sway bar. Here’s a look at the box the goodies come in. Here’s what’s inside, just begging to be installed!! 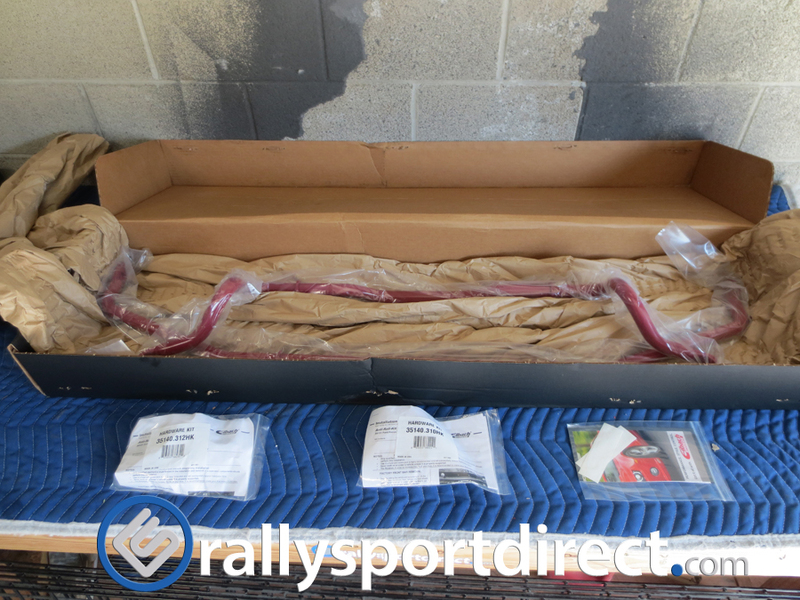 Front and rear sway bars, sway bar bushings, and installation hardware including lube. Let’s get to work! You’ll want to get your car either on a lift or on jack stands before you start on this project. Now that it’s in the air, we can get to that under tray. We have taken it off several times in the past, there are 8 t30 torx bit screws holding it on plus three holding the front rubber lip on. 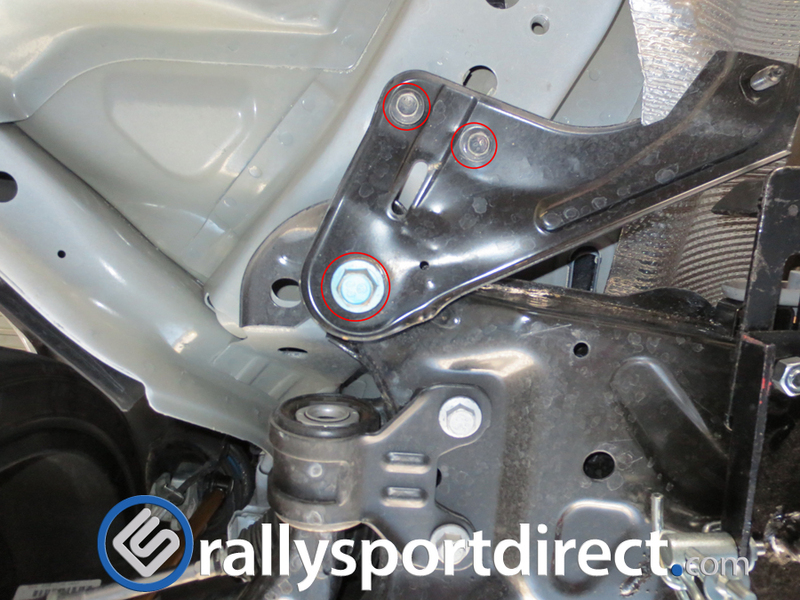 Now that we have that out of the way we can pull rear sub frame cross brace off, there are 4 bolts and 2 nuts holding it, and they are all 15mm. 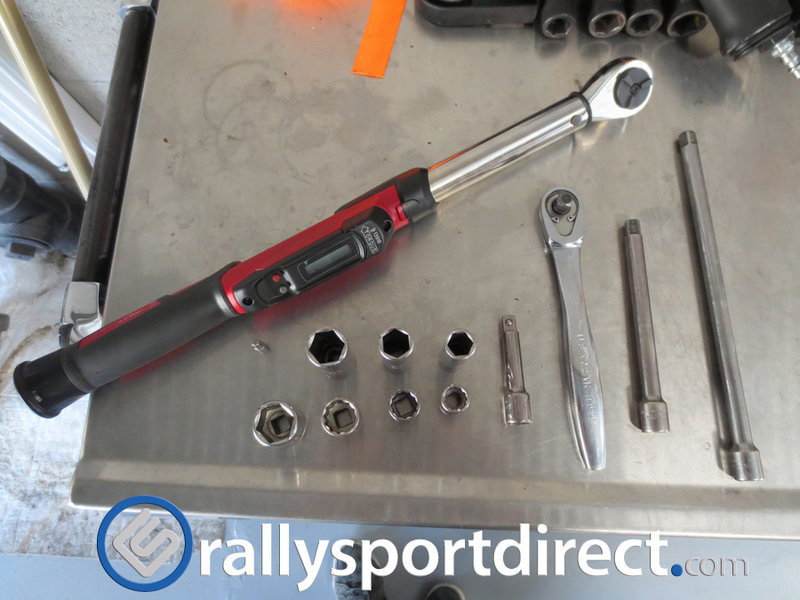 We used a ratchet and socket; you can use a wrench if you like. 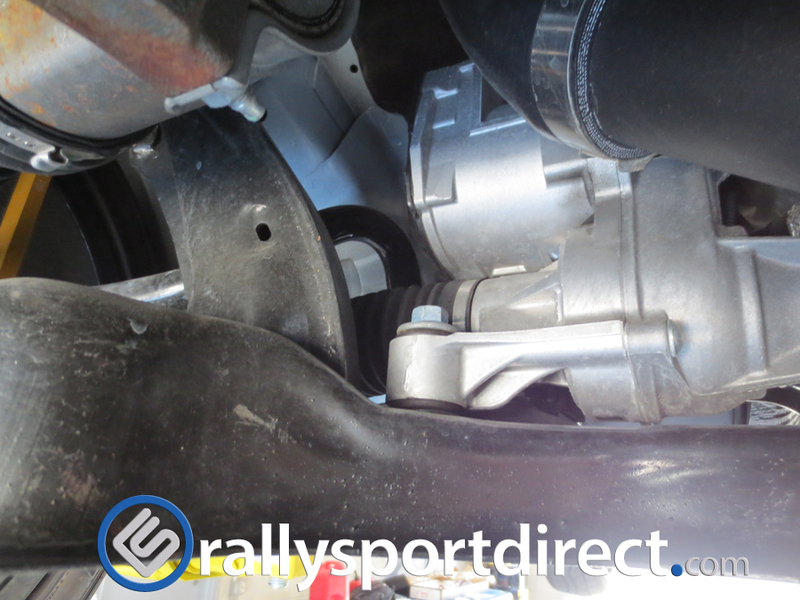 Now we’ll have to remove the rear motor mount (this would be a good time to upgrade it if you haven’t already, (here’s a link to the one we have installed) it has instructions on how to get the factory hardware out of the way. Your car’s setup might be slightly different than ours. 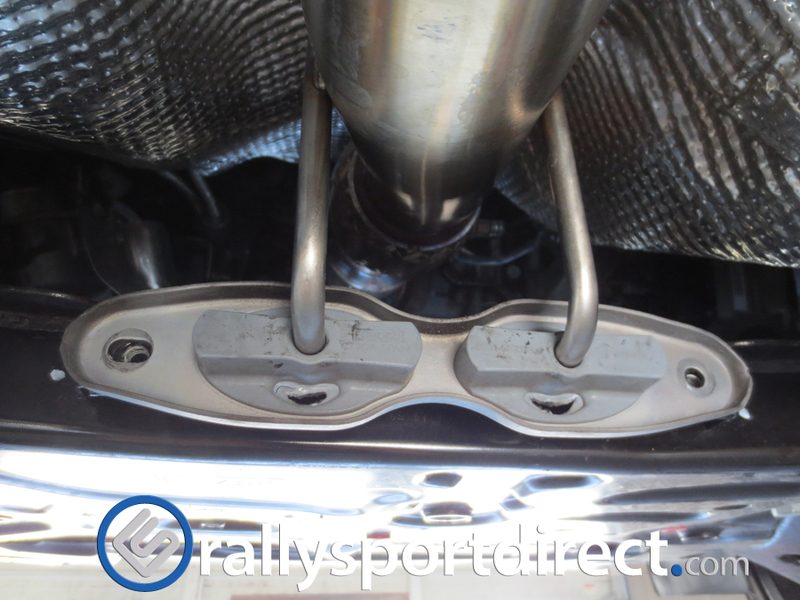 Now we can take the factory end links off, first slide your 15mm wrench on the nut and slip the 5mm allen wrench in the bolt to hold it while you take it off. 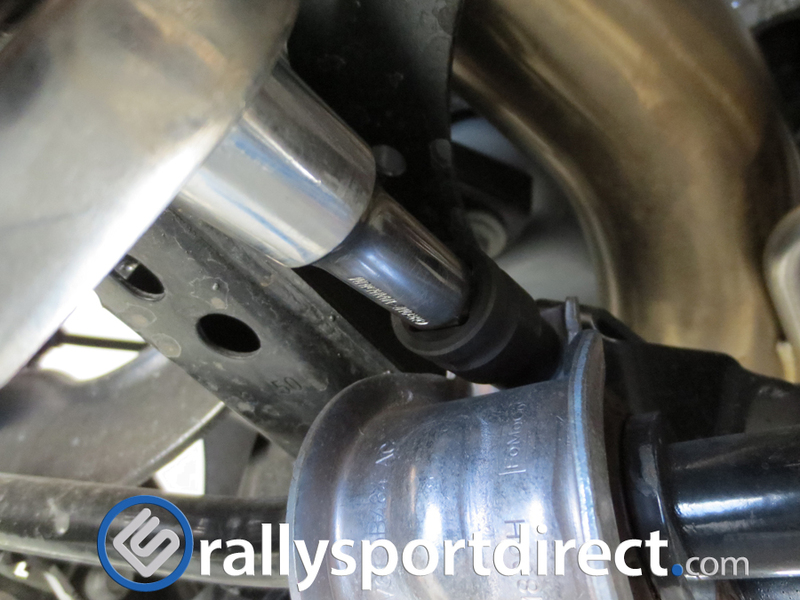 We had a little issue with our factory end link while trying to pop it out of the sway bar, the ball joint popped out of the end link. 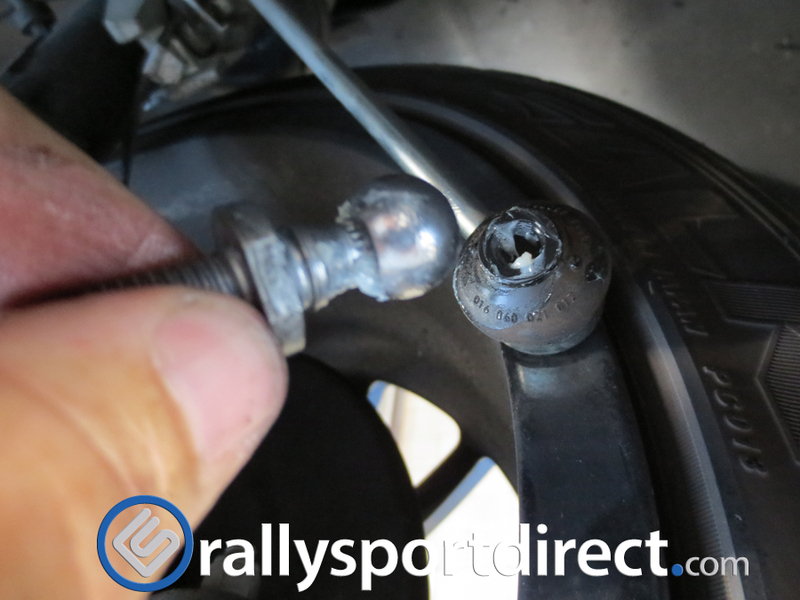 No problem for us, as we are installing Whiteline adjustable end links anyway, but if you have difficulty popping yours off, be extra careful this doesn’t happen to you. Here’s the adjustable end links from Whiteline, for more information on these end links, click here, or any image that shows the end links being installed. 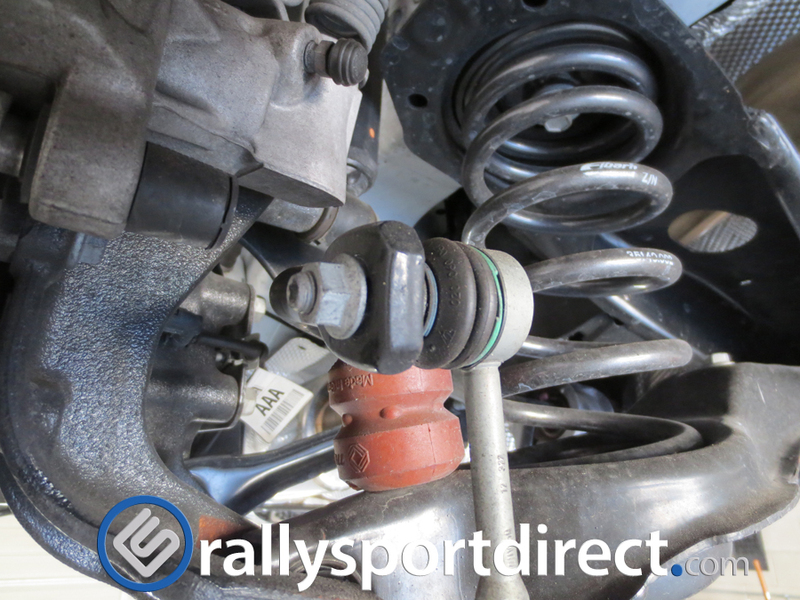 These are VERY robust when compared to the factory end links, and with them being adjustable, they are almost a must have on your car if you plan to take it to the track to tune your suspension. They are a nice piece and the build quality is phenomenal! 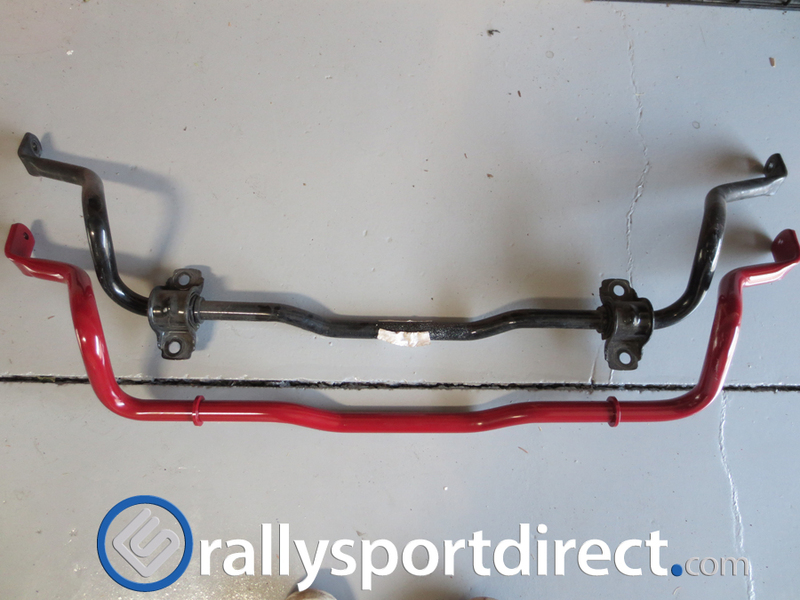 So we just have to adjust these to whatever length you want to run, we adjusted ours to factory length so we could give you some real world feedback on the sway bars. 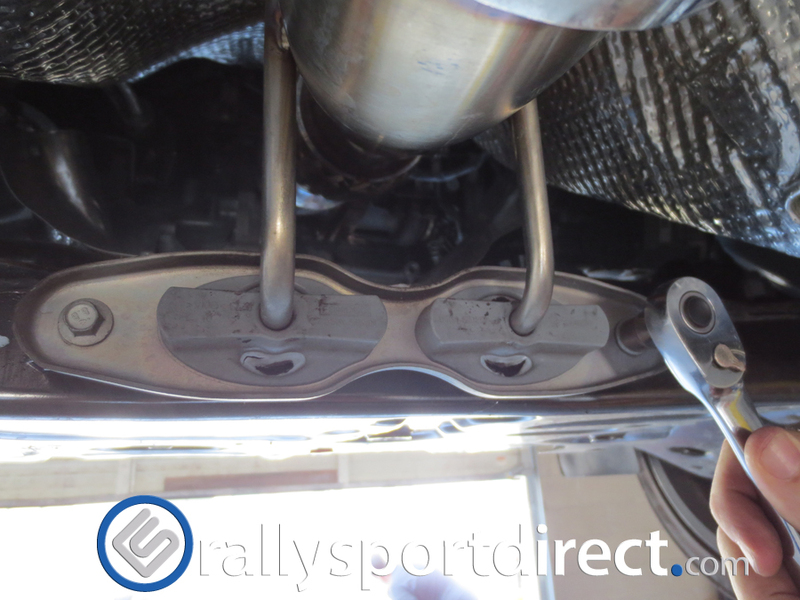 Then we just have to bolt in the tops of them to the factory holes, and leave them hanging for a little bit while we continue pulling the sway bar out. 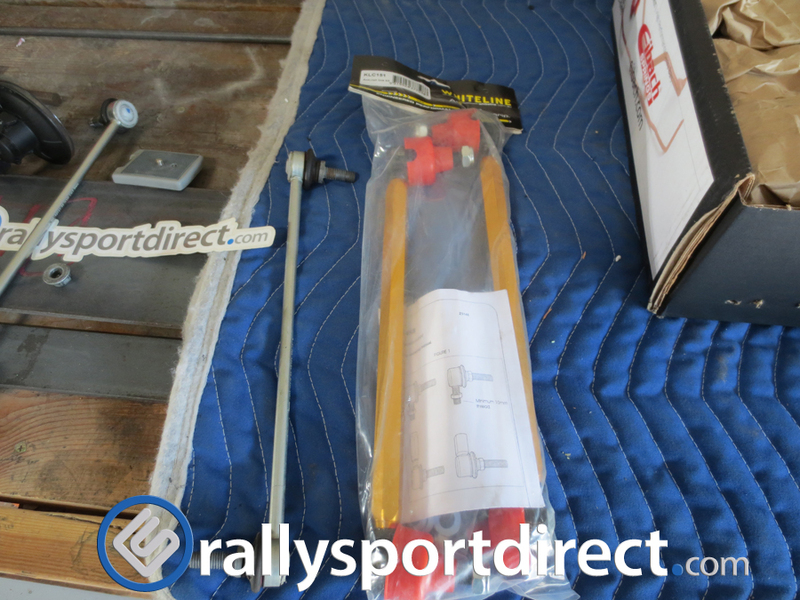 Now we can get back to removing the sway bar. Here you will want to support the engine with a jack, or something that will hold it up while dropping the sub frame. 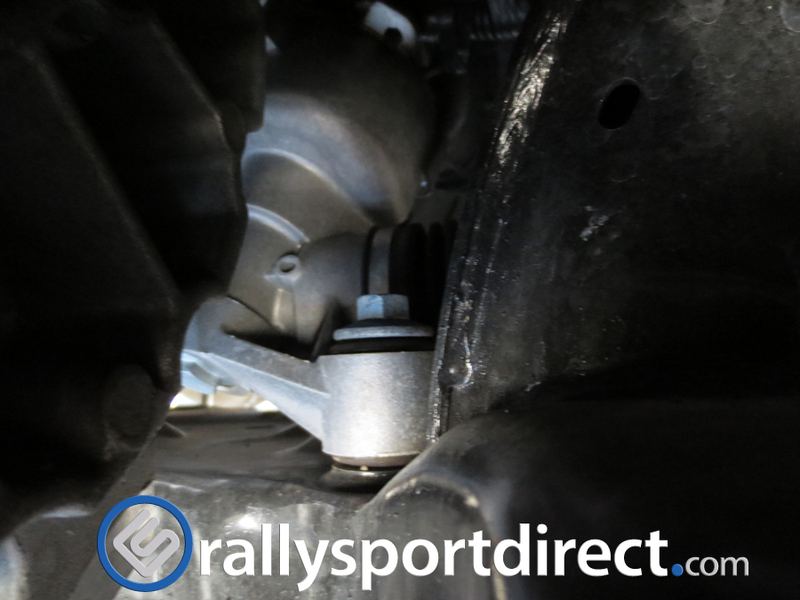 You’ll also want to put a jack under the sub frame itself to control the drop. 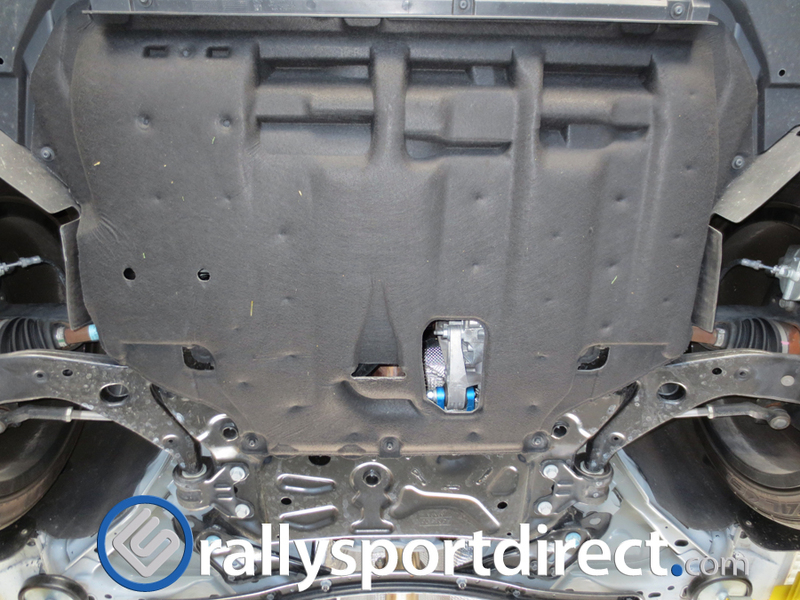 The next thing we need to do is remove the 2 front sub frame bolts. 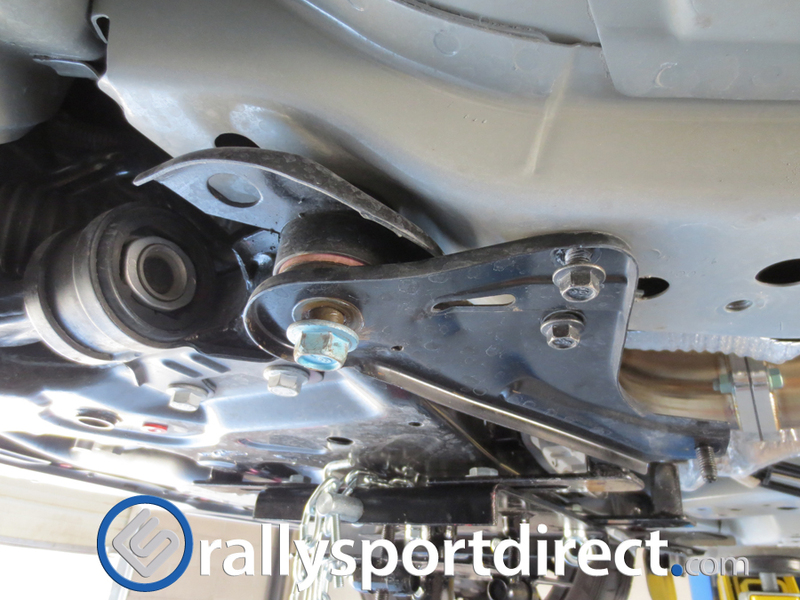 Here you will need a really long extension to get to the 2 bolts, they are quite a ways up and there is an access hole on both sides of the car through the lower control arm. These are 15mm Sorry for the lack of pictures here. I didn’t get any shots of these bolts. 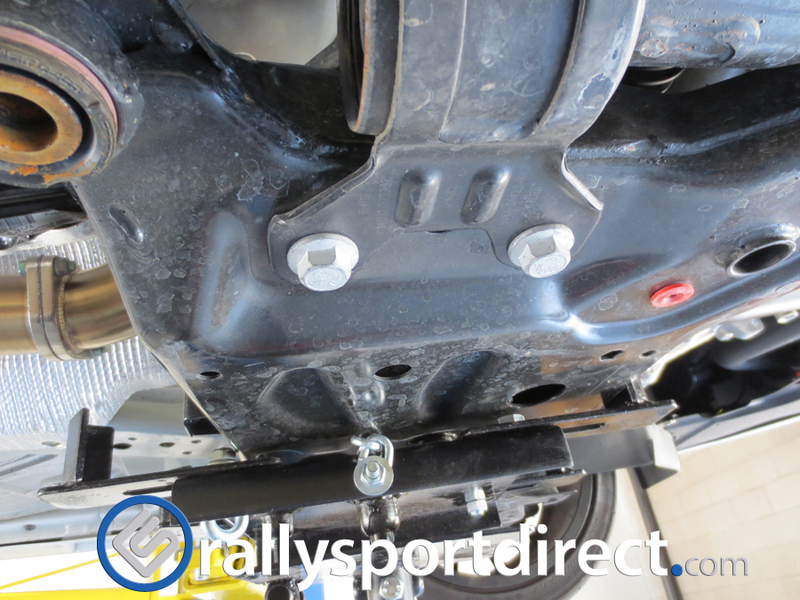 Now we can get the rear sub frame mounting bolts off. 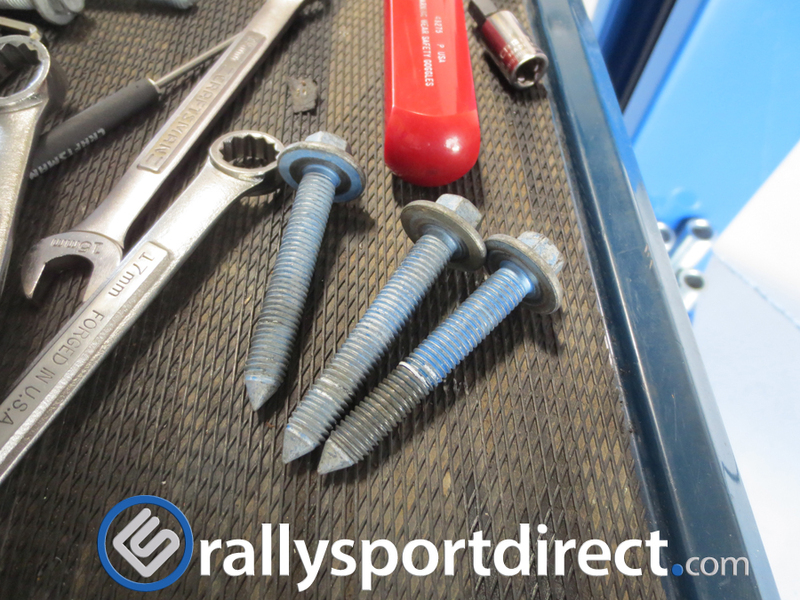 There are 6 bolts total, 4 13mm bolts and 2 21mm bolts. 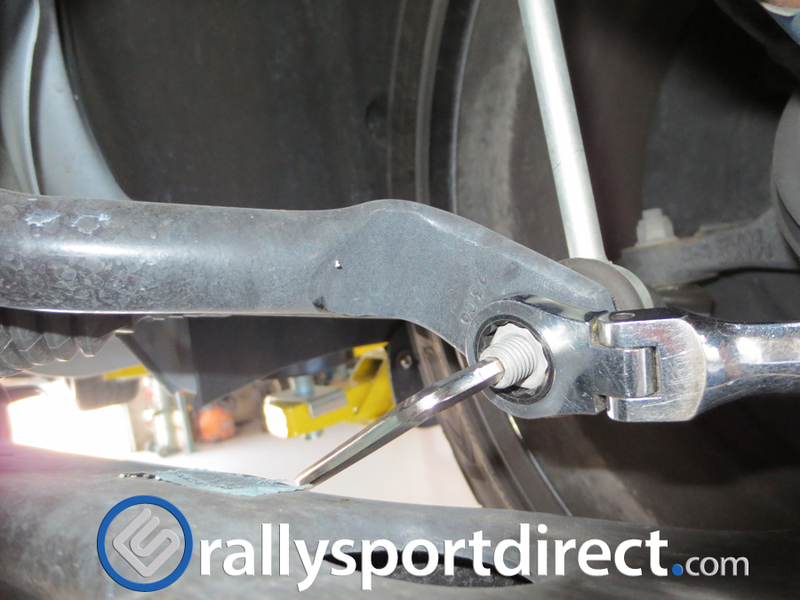 Next on the list is three 15mm bolts holding the steering rack in place. 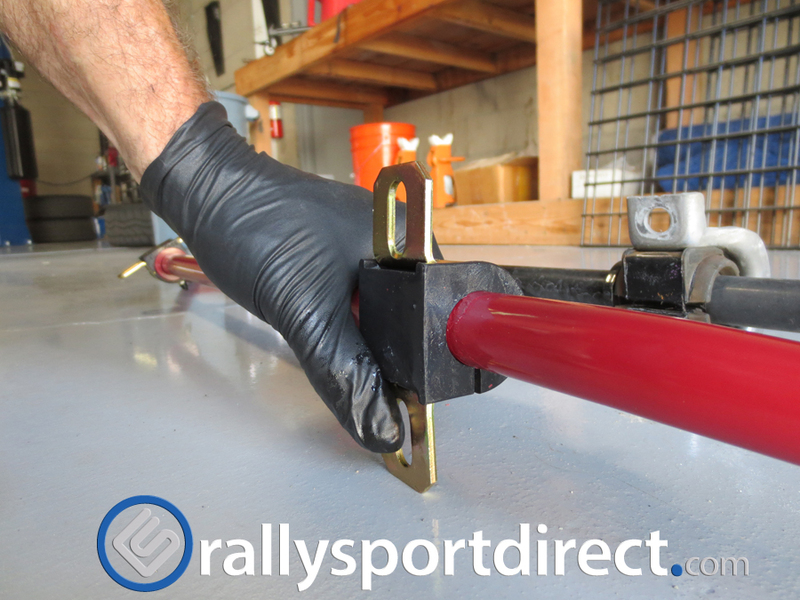 The one closest to the driver’s side is a little tricky to get to, but using a ratcheting wrench here will save you some time. There we go, got them out! 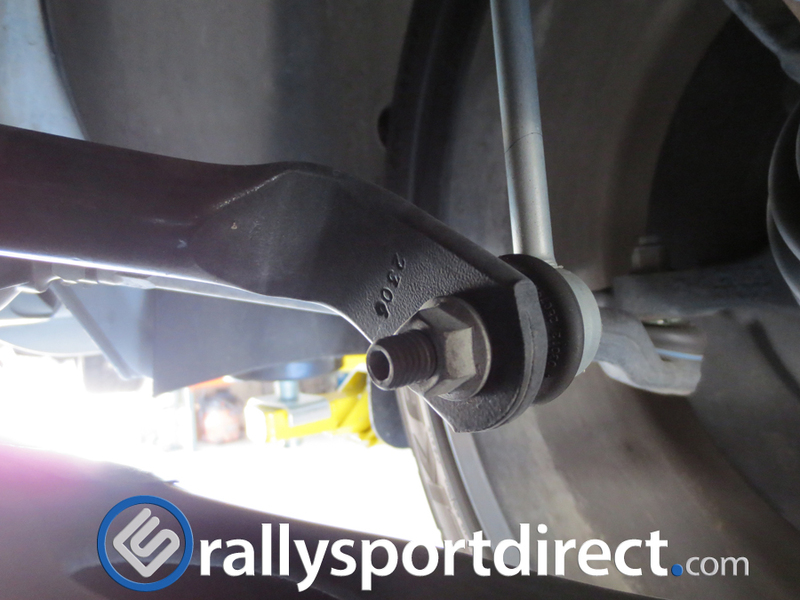 We can finally get to the sway bar bushing bolts! These take a 21mm on top, and an 18mm on the bottom. You will likely have to hold the 18mm head while ratcheting the 21mm nut off. Now the sway bar will slide out. You might have to wiggle it around slightly and lower the sub frame a bit more to get it out, but it should slide out fairly easily. 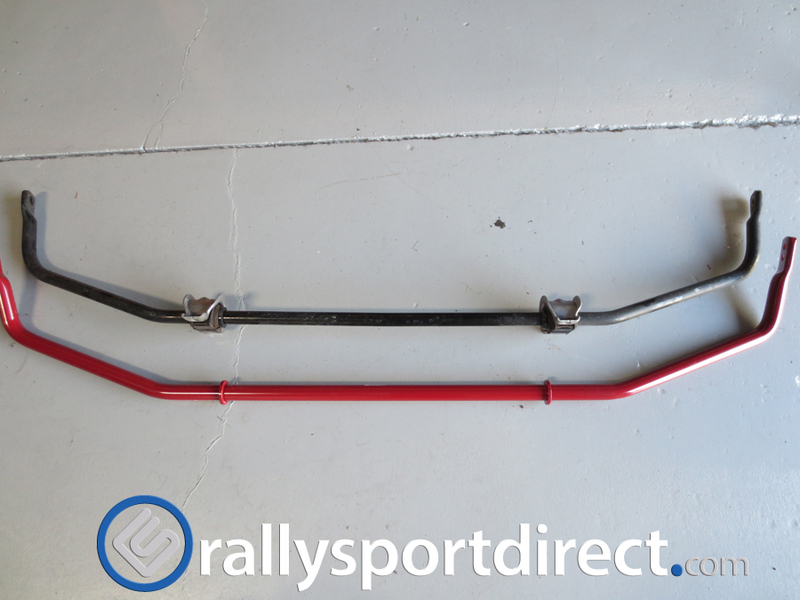 Here’s a comparison shot of the factory sway bar (in black) vs the Eibach sway bar (red) Pretty noticeable difference! 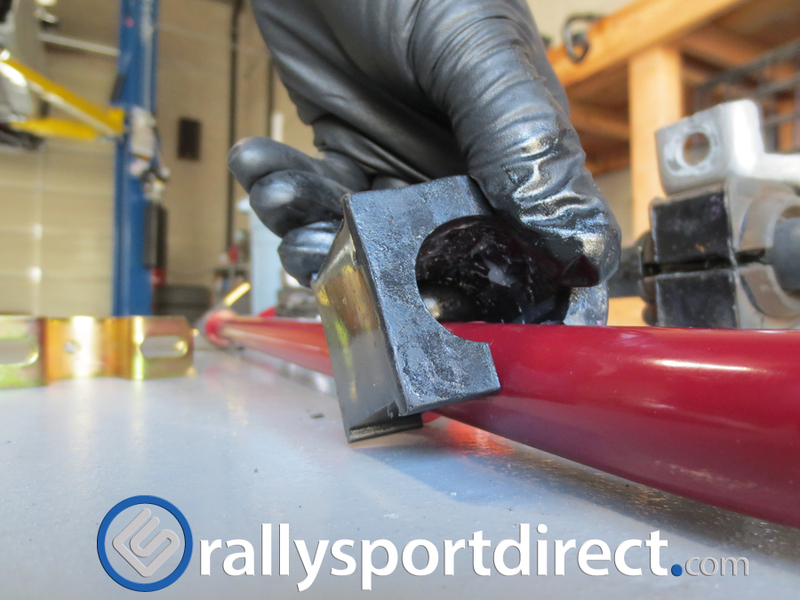 You will have to get the bushing mounts off of the factory sway bar because we will be re-using these with the bushings provided with the sway bar kit. 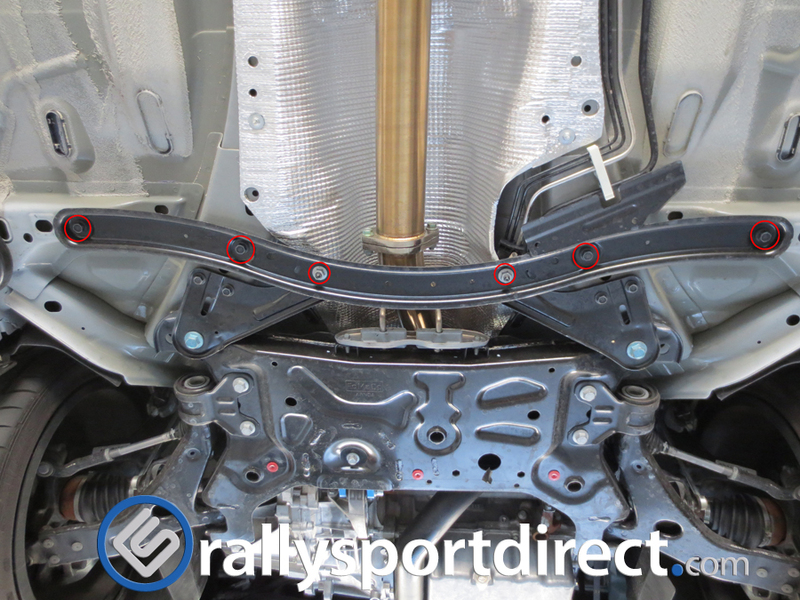 Don’t confuse the rear with the front bushings, they are in two separate bags and are clearly marked if you have any question. 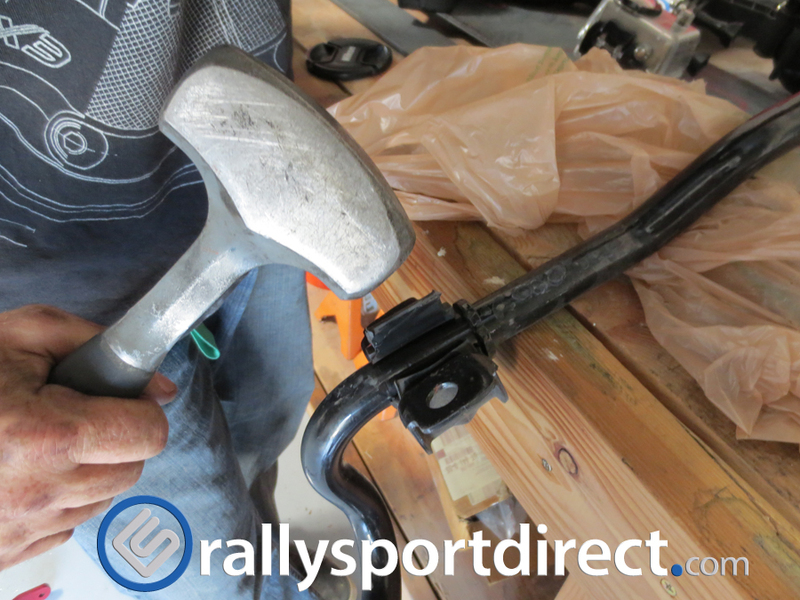 We took out old trusty and tapped the mounts right off of the stock sway bar. 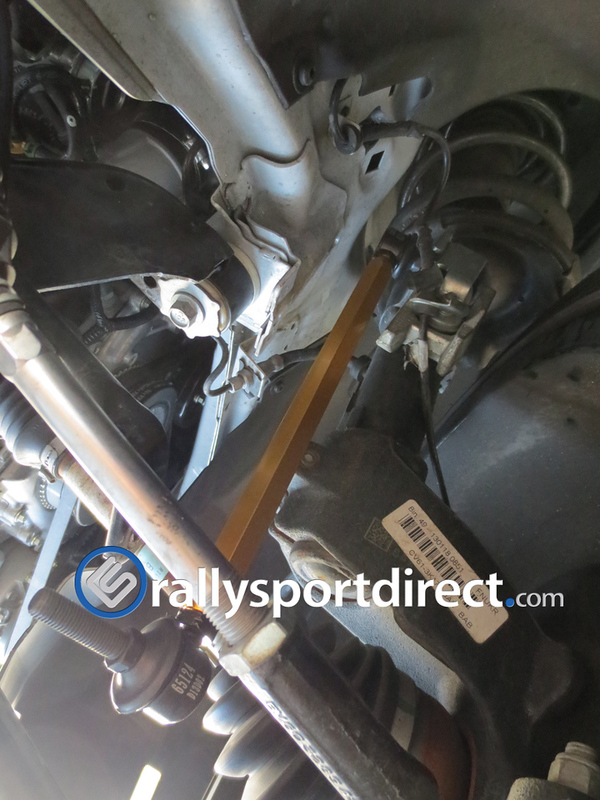 Here it is off, slide the factory bushing out, and lube up the Eibach bushings prior to installing them, there is a tube of lube in each package for the front and the rear sway bar, use approximately half of the tube for every bushing. There are grooves in the bushing that hold grease. 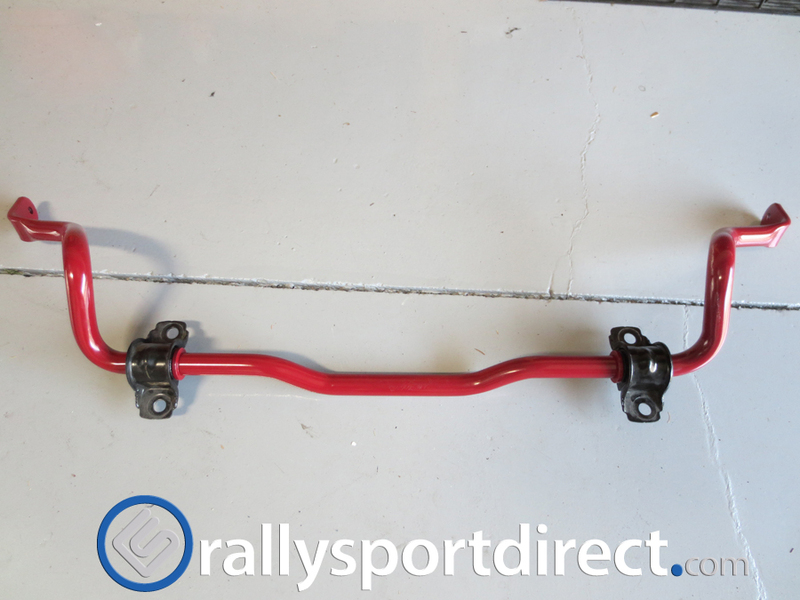 Here’s the new Eibach sway bar with the factory mounts and Eibach bushings installed on our new sway bar! 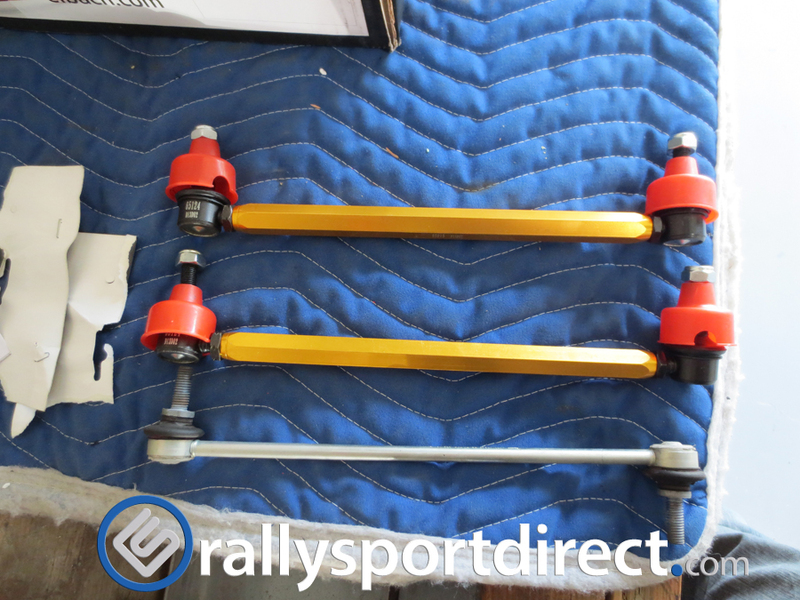 Now we can just throw the new sway bar back in place of the old factory sway bar, slide it up in there and bolt it all back down in reverse of the removal process! So we can call the front done! 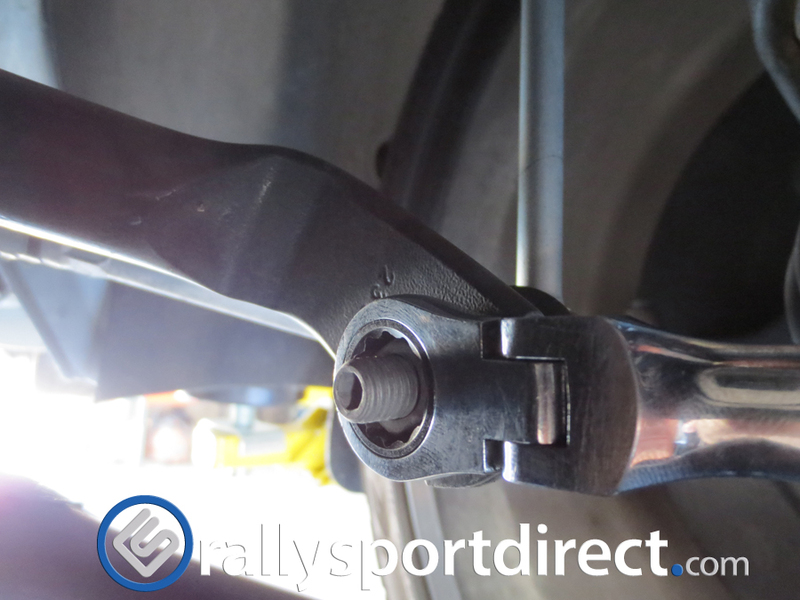 Here’s a shot of the sway bar and the Whiteline adjustable end link from the wheel well. Now that the front is done, let’s move on to the rear! The rear is a walk in the park compared to the front. There is just 6 bolts holding it in place. We’ll start by pulling the end links off. They take a 15mm like the fronts did. 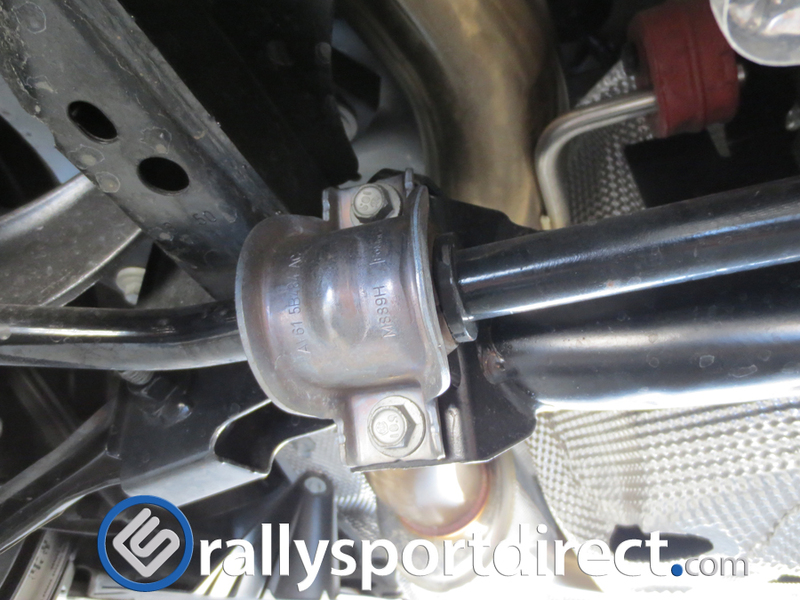 Now the sway bar mounts, they are just 2 13mm bolts on each side, and the sway bar slides right out. 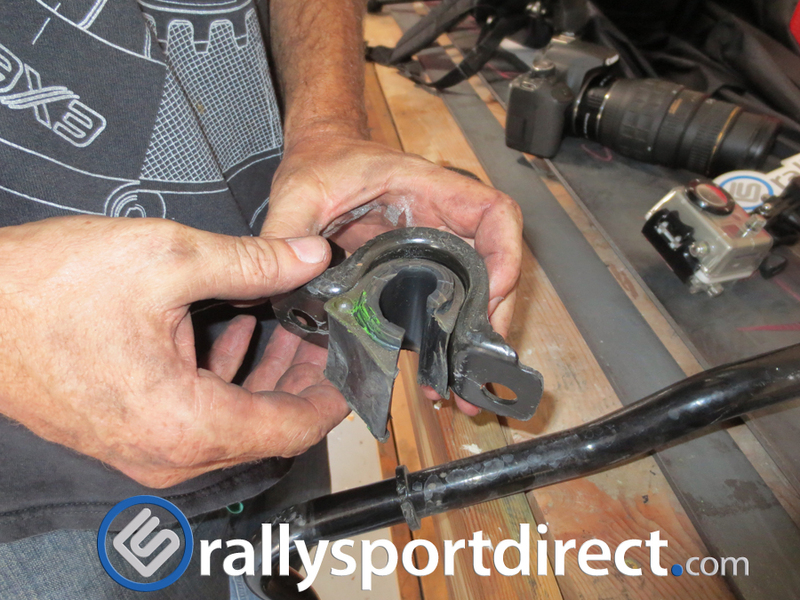 Lube up your replacement bushings and slide them on. Now throw your replacement mounts on and you’re ready to re-install this bad boy! Slide it in place and bolt it back down making sure that the “Eibach” writing is right-side-up and you’re ready to bolt it back in place. And that’s it! You’re ready to take your car out and have a feel. 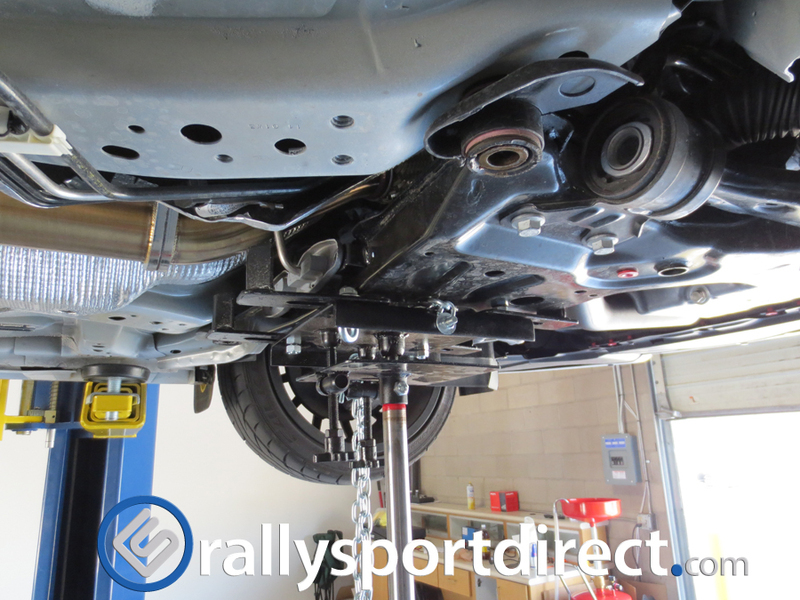 As with ANY suspension work, you will want to take it to have an alignment done. We experienced a slight steering wheel offset when we first installed these sways; one trip to the alignment shop takes care of that! 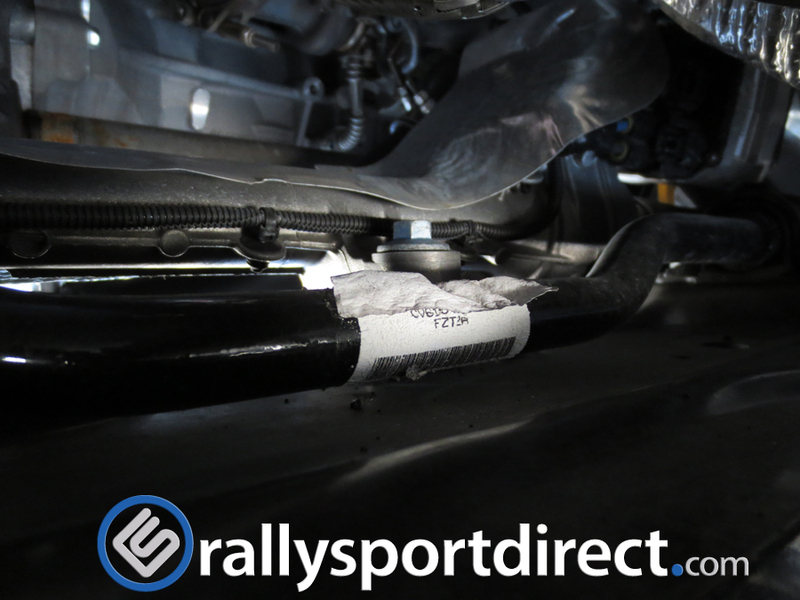 While we were installing the Eibach sway bars, we wanted to throw a little comparison/install video together for you, in the video we did a little slalom run with the stock sway bars and one in the exact place, with the exact positioning of the cones, with the Eibach sways. On to first impressions, I there is certainly a noticeable difference in cornering body roll. It has been reduced enough that I feel a bit more confident in the car’s ability to enter a turn with a bit more speed and not worry that I won’t be able to hit the next apex. The lift off over steer is still there, although I would say that it has reduced in its willingness to do so. The car seems a bit more planted if you will. I feel more in control, and ready for whatever the track or the street has to offer! 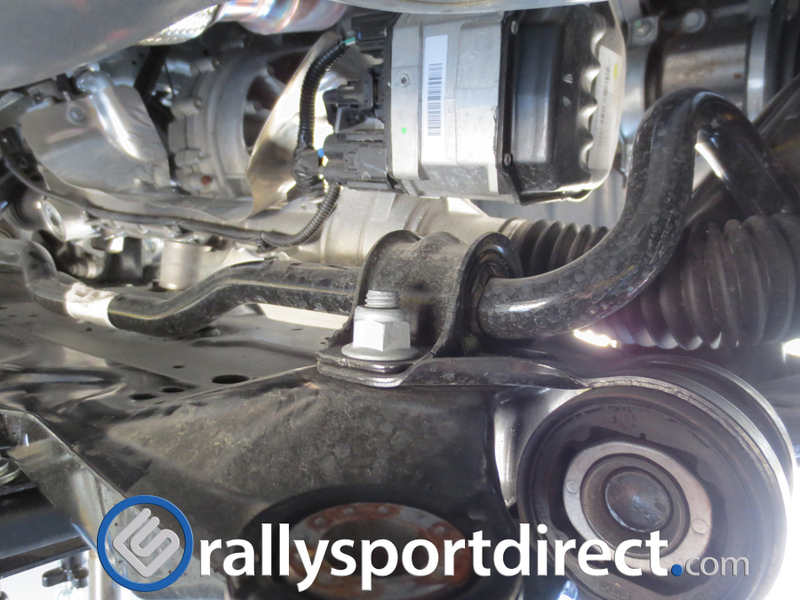 Hopefully this helps you guys/gals make a decision on your next suspension upgrade! Thanks for reading!